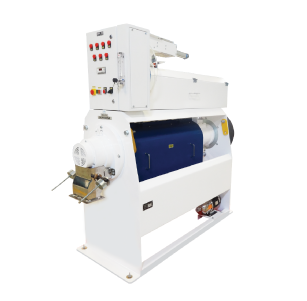 MILLTEC Water Jet (Silky) Polisher machine is used for polishing the rice surface by spraying water through the mixing chamber and by creating friction among the rice grains using milling rollers. The use of water gives the output grains a shiny surface, resulting in the name “silky” polisher. These have several features such as the presence of a motor outside the body of the equipment to facilitate easy maintenance as well as a reduced height to increase the stability of the equipment. The weight-controlled outlet of the polisher controls the retaining time of kernels inside the milling chamber. The water jet (silky) polisher produces rice grains with a shiny surface finish. The product is coated with a fine spray of water and is subjected to gelatinization in the polishing chamber, resulting in a high degree of glazing. The machine is specifically designed and best suited for Raw rice, Steam rice, Par-boiled rice and Boiled rice. The unique design of water dosing mechanism eliminates the use of compressed air. The moisture injection system ensures that the injection occurs only when the rice is available in the chamber. Specially designed CAM rollers ensure higher glazing with minimum broken.